Johns Island, SC – October 15, 2009—LoRiser Lift Company has introduced a new moveable front post option to their line of LoRiser Lifts, designed for tire, brake, and suspension work on heavy duty vehi-cles. The new pushbutton controlled hydraulically-moveable front post adjusts forward and rearward to accommodate trucks and busses of various wheelbases. The addition of a moveable front post unit to the standard fixed post rear unit allows lifting both the front and rear of vehicles at the same time. Contain-ment vaults housing lift components are flush mounted in the concrete floor. Johns Island, SC • October 3, 2013--LoRiser Lift, a specialty manufacturer of environmentally friendly in-ground lifts for brake, tire, axle, and suspension work, has introduced a lift specifically for Sanitation Trucks. Design features of this new lift allow “setup” and “teardown” in 1-2 minutes instead of the 40-60 minutes required using conventional floor jacks and axle stands. Improved operator safety is an added benefit of the LoRiser2. ATLANTA– Managers at Dekalb Fleet Management are always looking for ways to improve the effi- ciency of their maintenance shop, A few years ago, one of their priority items was finding a faster, safer way to perform brake jobs and tire changes..
Their traditional approach to set-up and tear down, with floor jacks and axle stands, was a laborious, repetitive, and time consuming task that took 45 minutes for each job. With their fleet of more than 200 sanitation trucks, the shop typically performs this task many times daily. 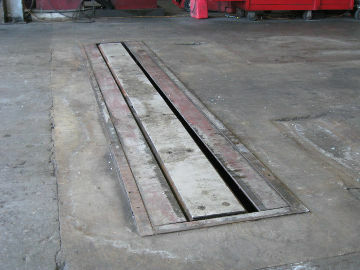 DeKalb’s management was also concerned about the safety of using floor jacks and axle stands. Jacks and stands can slip, allow- ing the truck to fall, damaging equipment and putting personnel at risk. DeKalb wanted to avoid the high cost involved with installing a full height in-ground lift. Plus, their shop had a low ceiling height. Knowing that the truck wheels only need be a few inches off the floor, and working near the floor saved a lot of lifting; some new thinking was engaged. During their search DeKalb came across the LoRiser Lift, which lifts heavy truck and busses by the axle for brake and tire work. Because their trucks had tandem rear axles, and they wanted the capacity to lift a fully loaded sanitation truck in an emergency, they needed a different design and a higher lifting ca- pacity than the standard LoRIser lift. So DeKalb Fleet Management consulted with Glenn Felpel, LoRiser Lift’s engineer to design a unit to meet their specific sanitation truck needs. The result of their combined efforts was the LoRIser2 Lift for sanitation trucks. Glenn said “The new LoRiser2 is different from other available lifts because it lifts the rear of the truck by the walking beam mounts located between the truck rear axles. This allows all 8 wheels to be lifted from one pick up point on each side simultaneously. Set-up and tear down times were reduced to less than one minute, and operation of the lift is accomplished with the push of a button. Safety is improved with the lift’s built in locking system. 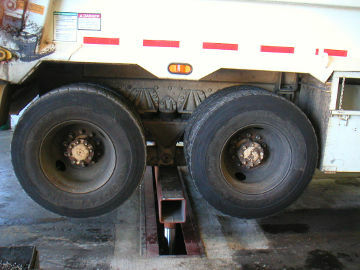 Bump bars on the floor allow for automatic truck positioning”.